The Cattle Egret that has been entertaining birders and photographers in recent weeks appears to have finally left the park, heading for warmer climes we hope. It had been making itself at home on the outer headlands happily gobbling up grasshoppers in the grasses and becoming more and more habituated to the constant flow of passers-by and dogs. There had been quite a lot of concern for its welfare with people worried that it might leave it too late to head south and it might need to be rescued from the cold. 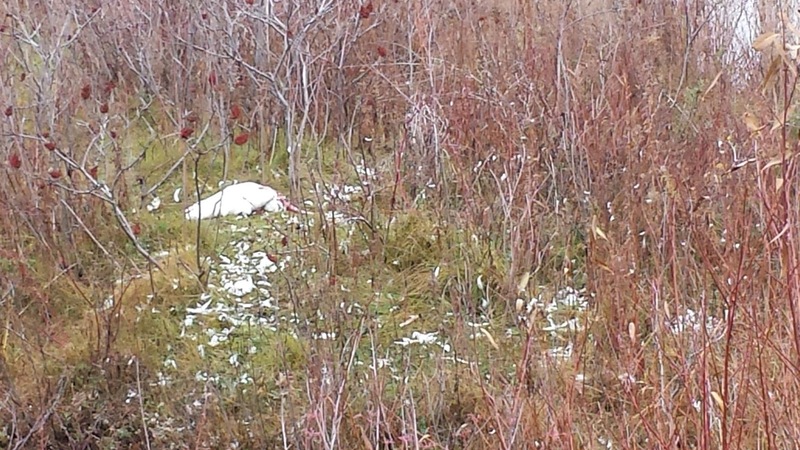 Yesterday, a Mute Swan was killed in the park either by a coyote or, more ominously, possibly by an off-leash dog. 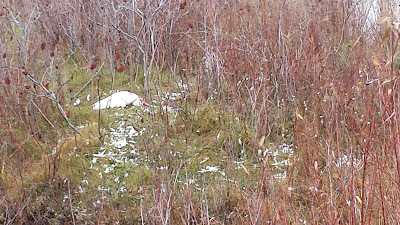 Most of the headless carcass was left and not consumed - unusual for a coyote. The swan must have put up a hard fight but eventually it succumbed to its gruesome death. The swan was banded and a report was made to Environment Canada. The band information showed that the swan was hatched in 2010, was a male and it was banded on February 22nd, 2012 in La Salle Park, Burlington, Ontario. The Park Supervisor has also been notified with a clean up of the site expected soon. If anyone has any information on this matter, please contact Friends of Sam Smith Park. If anyone comes across a dead bird that is banded or has a coloured marker on it, here's where to report it. 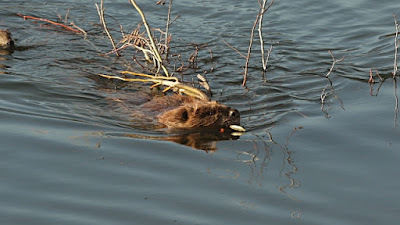 Our beavers have been very active in the park recently. They are "stocking up" their winter food supply by placing tree branches (willow and poplar) in close proximity to their winter lodge. 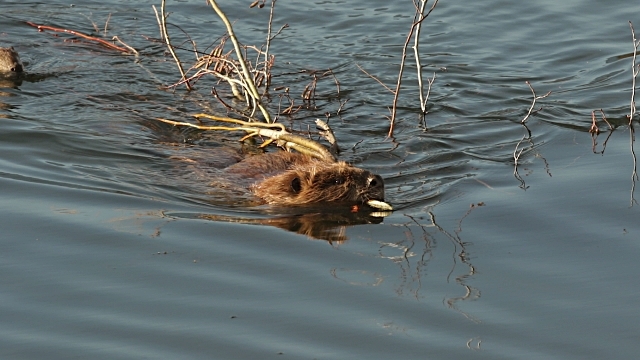 Click here for more information on the Castor Canadensis. FOSS is looking for volunteers for its "Winter Bird Feeder Program". This program was started last winter, and was so successful that we are continuing it again this year. We will be placing several small bird feeders around the edges of the skating trail at Colonel Sam - seed and suet feeders. We need volunteers to check the feeders when they are in the park- hopefully at least once a week- and refill them when needed. We will supply you with bird seed and suet cakes. The program will run from December till mid-March, to coincide with the skating season. If you can help, please email FOSS. Myrna Markovich found her Sam Smith Park "secret place" on a very hot day in summer when her walking group needed refuge from the sun. Thank you for sharing your photograph of this cool, shaded spot. Check out more "secret places". 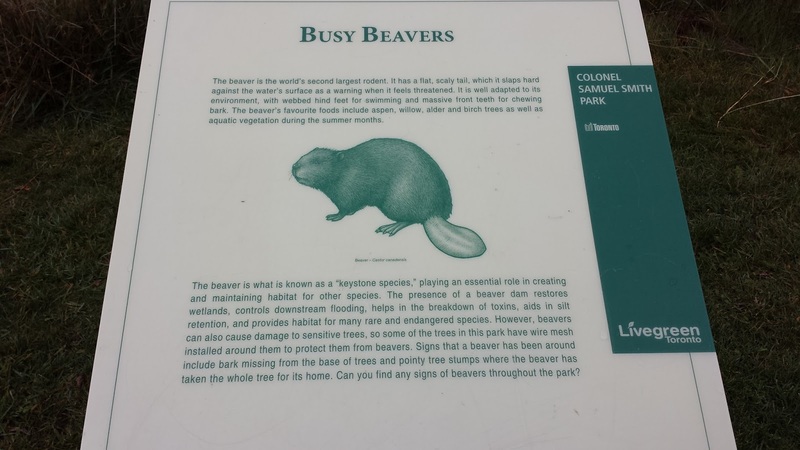 Sam Smith Park has been described as quite a small park, but one with a wide variety of natural habitats contained within it. Those different habitats, naturally, attract a wide variety of migratory and resident bird species as well as other fauna. 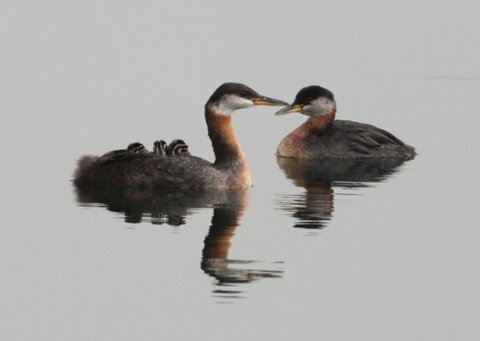 Over the years, as the park has matured, it has become a birding hot spot largely for this reason. SAM SMITH PARK'S "SECRET PLACES"!